This time you have a great chance to play the real hockey championship! Just choose the character and become the winner of each stage. Use the mouse to control and travel through the world. Enjoy this cool sport game and do everything to vanquish the game. This is a cool sports game with realistic physic, where you can check all your skills. Just control the mallet with your mouse and try to push the puck into the opposing player's goal. 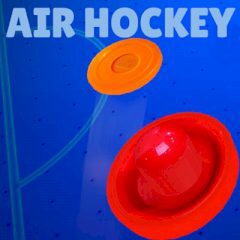 Air hockey is one of everyone's favorite challenges! By the way, every country's player brings their own tactics and challenges, so stay alert. Some of the most realistic physics for air hockey are right here. Select your country and play against the other top teams of the world, beat them all and become the World Champion. The first player to accumulate seven points wins the game.